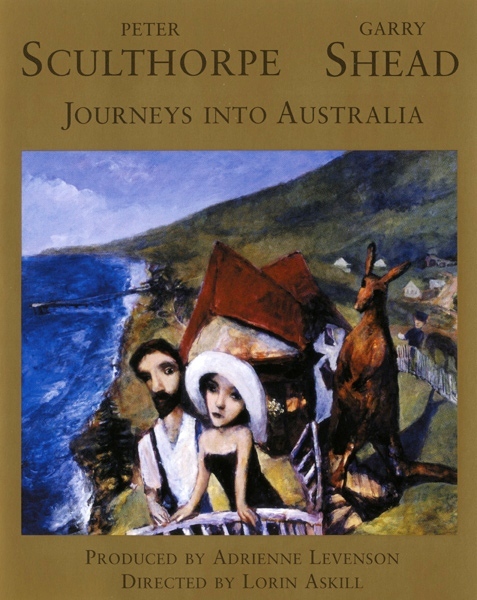 Peter Sculthorpe Garry Shead DVD titled Journeys into Australia. $35.00 plus $12.50 shipping and handling. Professor Sasha Grishin AM, FAHA The Sir William Dobell professor of Art History, Australian University, officially launched on the 7th of May 2010 the new Peter Sculthorpe Garry Shead DVD titled Journeys into Australia. Guest Speakers where Music Composer Peter Sculthorpe and Host Stuart Purvis of Australian Galleries. Peter Sculthorpe is one of Australia’s greatest contemporary composers, while Garry Shead is one of Australia’s most distinguished visual artists. For many years they have travelled along parallel paths, sharing common interests and common sources of inspiration. In their separate ways, they have explored a fascination with the Australian landscape and its cultural identity. They have responded in very personal ways to two significant events in Australia’s literary history. The first of these was D.H. Lawrence’s novel Kangaroo, written in 1922 when Lawrence and his wife Frieda lived in Thirroul, NSW. The other was the poetry of ‘Ern Malley’, a pseudonym created in 1943 by the poets James McAuley and Harold Stewart, who cobbled together some poems one afternoon, picking words and phrases at random, and sent them as a hoax to the poet Max Harris for publication in the journal Angry Penguins. The Fifth Continent, The Queen and The Ern Malley Suite mark a most remarkable act of collaboration between the composer and the artist. Working from similar sources of inspiration, but quite independently of one another, Peter Sculthorpe has created amazingly evocative passages of music and Garry Shead has created three series of paintings which have become iconic in Australian visual culture. The collaboration involved the bringing together of the pre-existing music and images, juxtaposing them with some of the original literary sources that inspired them. What is truly astonishing is that when these disparate elements were brought together, they combined seamlessly into a single creative whole. Music by Peter Sculthorpe • Paintings by Garry Shead Conceived and produced by Adrienne Levenson Directed and edited by Lorin Askill. © 1997 Australian Broadcasting Corporation and Licensed courtesy of Australian Broadcasting Corporation. Text, by D.H. Lawrence and Peter Sculthorpe speaker. Music by Peter Sculthorpe: Music for Federation (2001) Melbourne Symphony Orchestra, Markus Stenz conductor © 2001 Australian Broadcasting Corporation and. Licensed courtesy of Australian Broadcasting Corporation. © 1995 Australian Broadcasting Corporation Licensed courtesy of Australian Broadcasting Corporation. © 1997 Australian Broadcasting Corporation Licensed courtesy of Australian Broadcasting Corporation. A Village Funeral Song of the Hills from My Country Childhood (1999) Adelaide, Symphony Orchestra, James Judd conductor, ® 2006 Australian Broadcasting Corporation Licensed courtesy of Australian Broadcasting Corporation. Supplied courtesy of the, National Film and Sound Archive. Supplied courtesy of radio station 4BH 882, Brisbane and the National Film and Sound Archive. Thanks to Catherine Seccombe of NFSA for her assistance. Texts by Ethel Malley and Ern Malley, Adrienne Levenson and Peter Sculthorpe are speakers. The poetry of Ern Malley, taken from Collected Poems (1993), published by ETT Imprint, Sydney, is quoted with the permission of the estate of Max Harris, as is Ethel Malley’s letter. Thanks also to Samela Harris for her assistance. JOURNEYS IN TO AUSTRALIA – AT ETCHING HOUSE OR AN ABC SHOP NEAR YOU. Fine Australian performers including Barbara Jane Gilbey, the Tasmanian Symphony Orchestra and Adelaide Symphony Orchestra, Also available form the ABC Shop when stock is available.